Pork makes us think of apples, which make us think of fall and all things cozy, which is why we’re practically drooling over this comforting sweet-and-savory meal. As a bonus, our chefs snuck some cauliflower into the mashed potatoes for a boost of nutrition and extra silky texture. Wash and dry all produce. Preheat oven to 400 degrees. 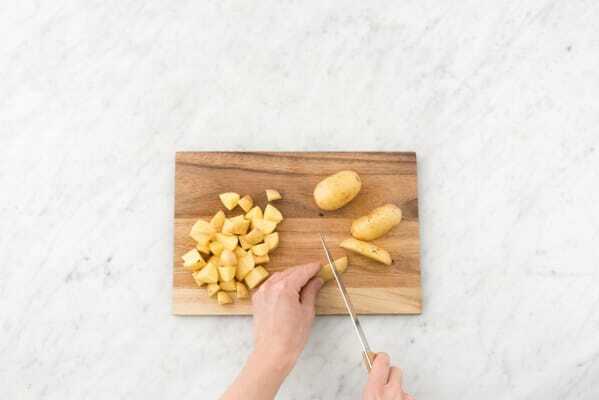 Chop potatoes into 1-inch cubes. Place in a large pot of salted water along with cauliflower florets. Bring to a boil. 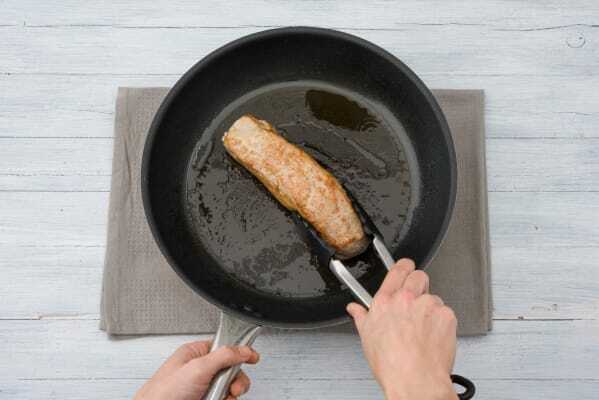 Cook until fork-tender, 12-15 minutes. Drain and return to pot. Meanwhile, heat a drizzle of oil in a large pan over high heat. Season pork on all sides with salt, pepper, and thyme. Add to pan, and sear until golden brown all around, 1-2 minutes per side. Roast the pork and snap peas: Trim snap peas. When pork has browned, transfer to one half of a baking sheet. Add snap peas to other half, and toss with a drizzle of oil and pinch of salt and pepper. Roast until pork is cooked to desired doneness (we like ours slightly pink) and snap peas are bright and tender, 10-12 minutes. Make the apple pan sauce: While pork cooks, core and thinly slice apple. Heat 1 Tablespoon butter and a drizzle of oil in same pan over medium heat. Add apple slices. Toss until softened and slightly golden, 3-5 minutes. Season to taste with salt and pepper. Add stock concentrate and ½ cup water. Simmer on low until thickened, 3-5 minutes. 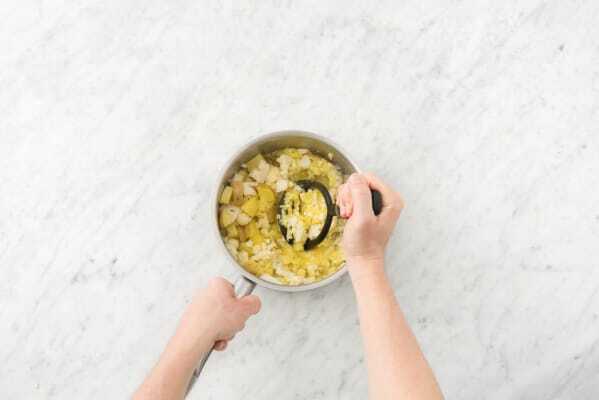 Add 1 Tablespoon butter to cauliflower and potatoes. Mash with a fork or potato masher until smooth. Season generously with salt and pepper. Reheat over low if necessary. Thinly slice the roasted pork tenderloin. 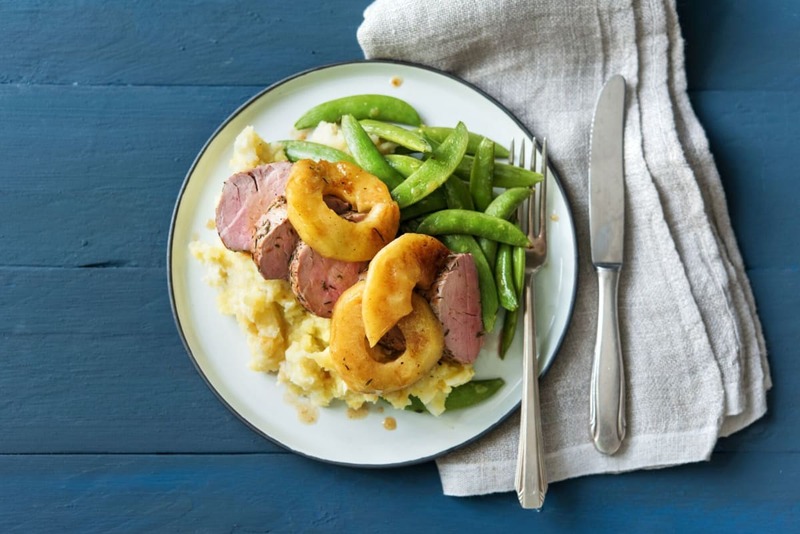 Serve on a bed of potato cauliflower mash with snap peas on the side. Drizzle with apple pan sauce and enjoy!